 2-våningsvagn 1/2:a klass DABpza 785.1 typ DB AG "Regio"
2-våningsvagn 1/2:a klass DABpza 785.1 typ DB AG "Regio"
Denna produkt ger dig 1618 bonuspoäng. 2-våningsvagn 1/2:a klass DABpza 785.1 typ DB AG 'Regio', längd över buffertar 167 mm, epok VI. Prototype: German Railroad, Inc. (DB AG) type DABpza 785.1, 'Service' bi-level car, 1st/2nd class. Built starting in 2003. 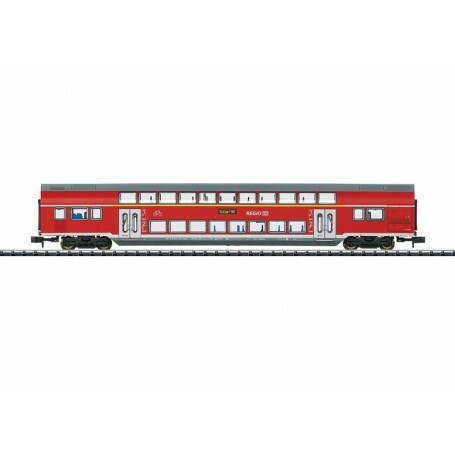 Model: The car has built-in LED lighting with lighted train destination signs and close coupler mechanisms. Length over the buffers 167 mm / 6-9/16'. Highlights: Tooling variation. LED interior lighting. Lighted train destination signs.